Cacouna’s church and presbytery around 1935. This splendid church and impressive presbytery standing in the heart of the village continue to bear witness to the early settlers determination to form their own parish. 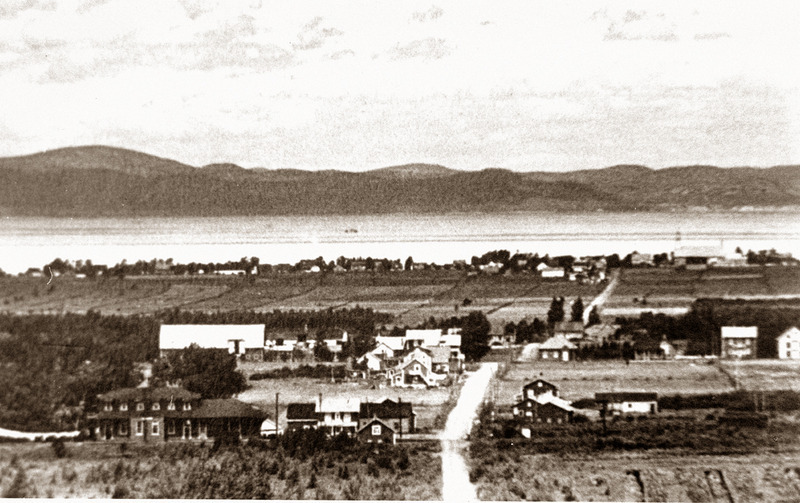 View over the village of Cacouna, around 1940. 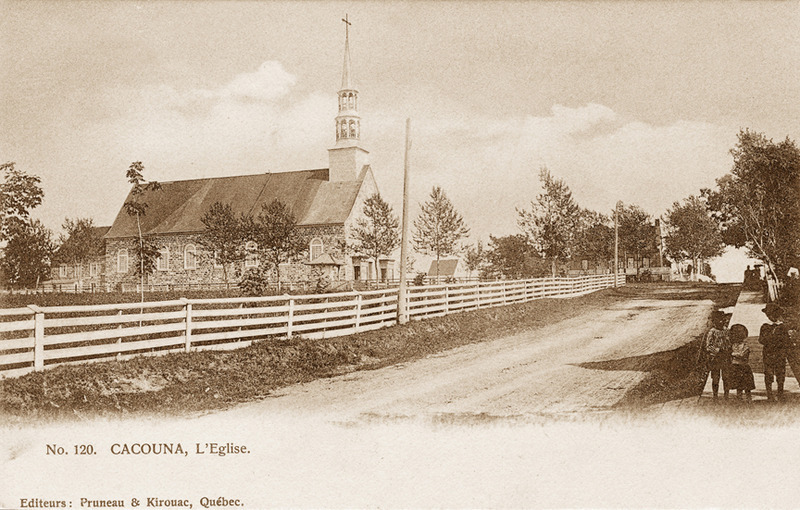 Before mass, those who came from the five concessions in the LeParc seigneury hurried to shop at the general store, collect their mail and occasionally consult with the notary. 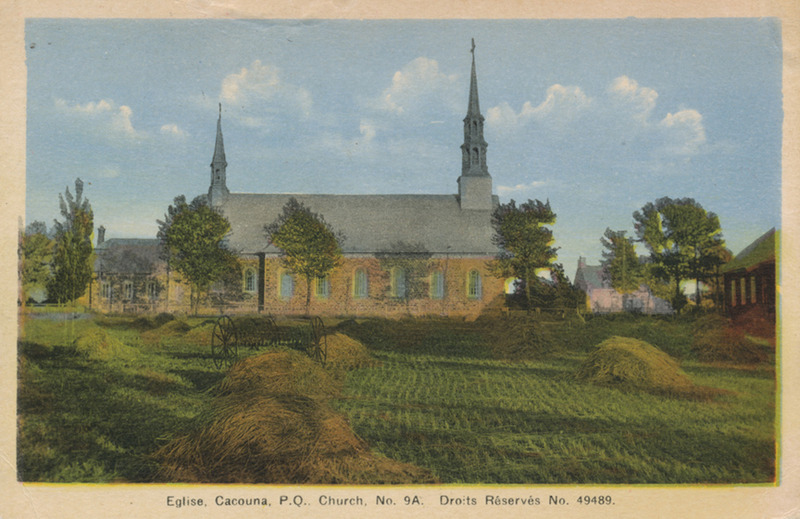 The church before the 1892 alterations. The church was built in two stages. In 1840, the walls began to go up using local fieldstones and lime provided by the parishioners, but construction was soon halted and did not resume until five years later. Nevertheless, it opened for worship in 1848. It is not known who drew the plans for the nave leading to a narrower chancel and ending in a straight chevet, with its adjoining sacristy. The sober facade rises to an elegant steeple comprised of two lantern turrets and a tapered spire. Although the Saint-Georges church closely resembles those designed by the architect Thomas Baillairgé, historian Gérard Morisset attributes it to Louis-Thomas Berlinguet. Moreover, François-Xavier Berlinguet, an architect sculptor like his father, is known to have done the church interior between 1852 and 1857. The church with its second belfry. During renovations undertaken in 1892, an architect from Quebec City, David Ouellet, was called upon to draw the plans. A belfry was added to the chevet to house the bell given to Cacouna by Seigneur Alexander Fraser in 1820. 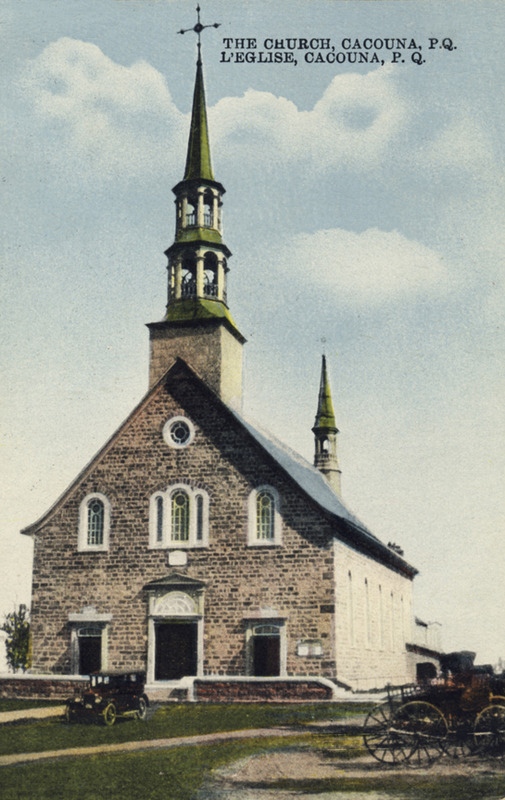 With the interior and exterior renovations completed, Saint-Georges church was finally consecrated on September 11, 1897. The church and presbytery were classified historic monuments in 1957. 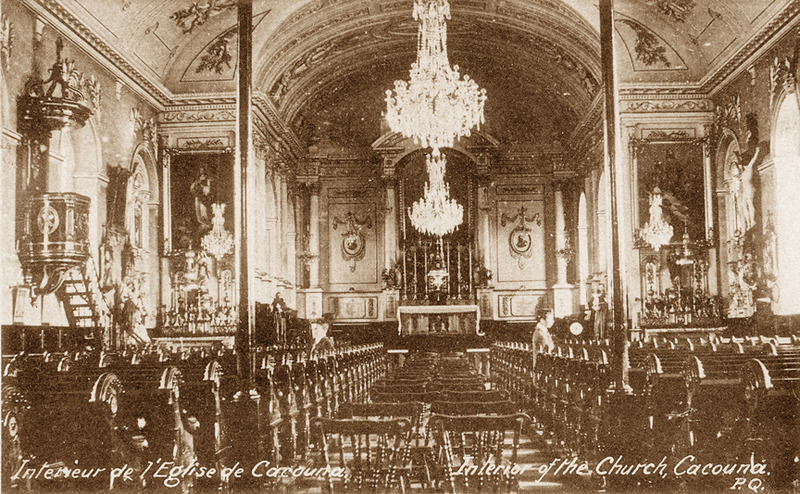 The church interior around 1927. The church interior by François-Xavier Berlinguet. The retable is a masterpiece. The stained-glass windows in the chancel were done by the Quebec firm Bernard Léonard, and the oil paintings are by roman artists. The organ was built in 1888 by Eusèbe Brodeur, while the magnificient crystals chandeliers date from 1890. 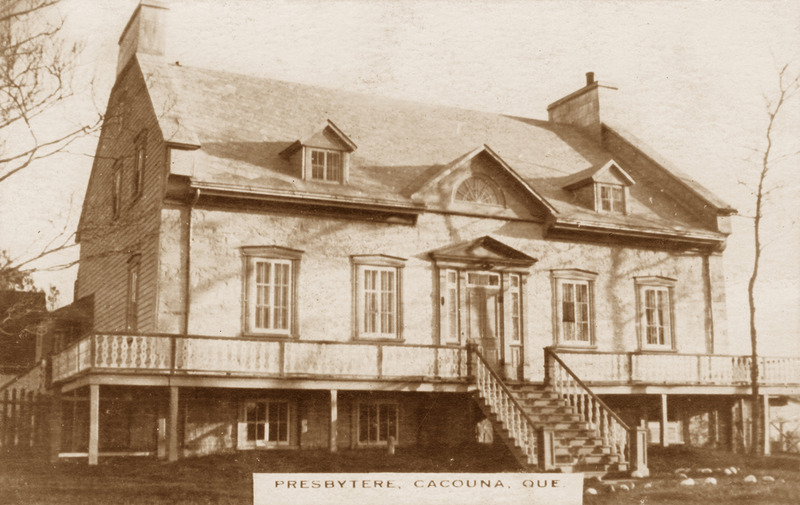 Between 1835 and 1841, Curé Edouard Quertier supervised the stonemasons and carpenters hired to build a presbytery worthy of the parish. A solid stone building was erected on high foundations, with massive chimneys extending from the fire walls at either end. 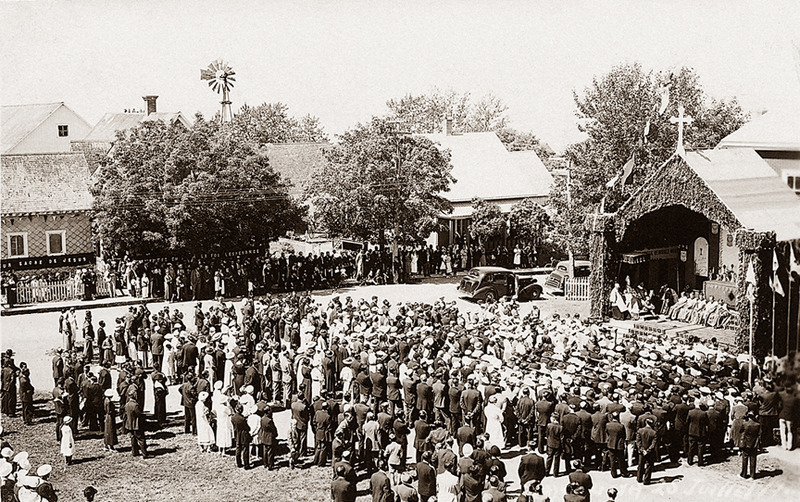 The 1937 Eucharistic Congress in front of the parish hall. This rectangular building with a hipped roof and broken gable was built in 1932 to replace the small « public hall » near the cemetery. 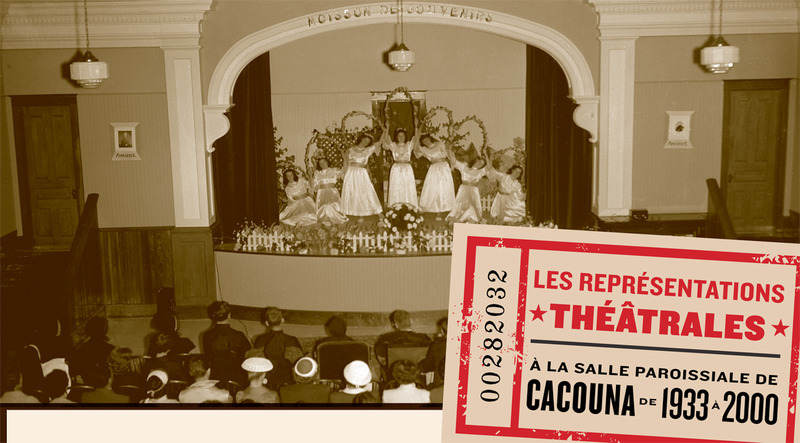 The current parish hall was inaugurated during the agricultural fair on March 23 and 24, 1933 and, after being blessed by Right Reverend Georges Courchesne, the Bishop of Rimouski, the Enfants de Marie put on a play in front of a large crowd. 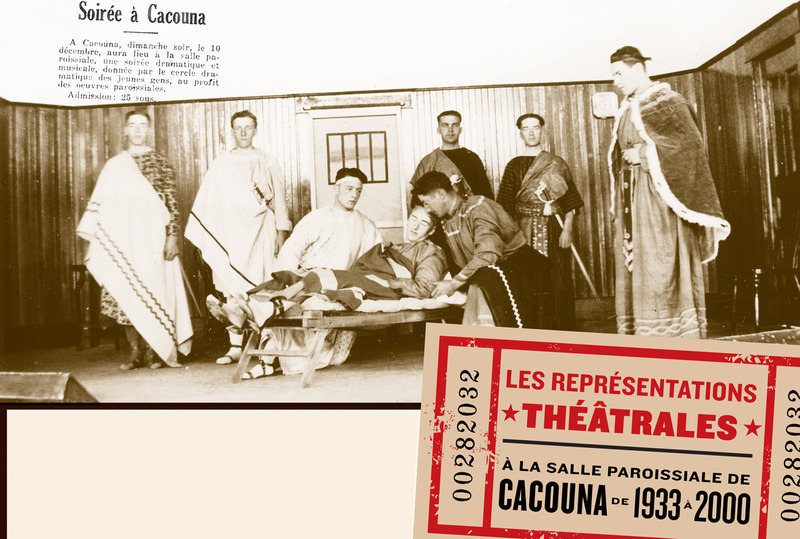 The actors of the «Cercle dramatique des jeunes gens» of Cacouna performing «Le signe de la croix», in 1933. Boarders and day students from Cacouna’s Convent sang and performed on the stage of this theatre. 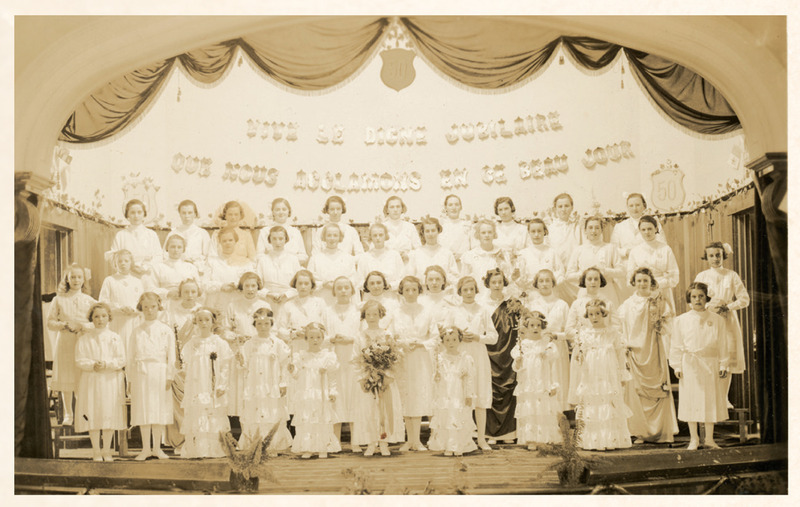 In 1938, forty-five young girls from the «Enfants de Marie Congregation» honor the Golden Jubilee of Right Reverend Louis T. Landry. On June 30th 1957, a special representation celebrating the centenary of the Convent of the Sisters of Charity. A choreography, Ronde des fleurs, was part of the performance. Photo : Musée du Bas-Saint-Laurent, Antonio Pelletier Collection. 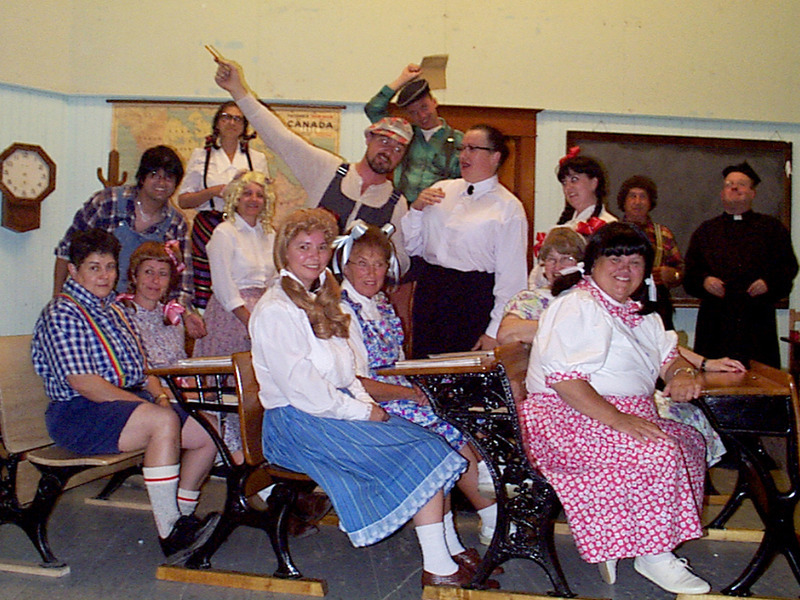 Close to twenty comedians played schoolchildren in the theatrical performance «La classe de Mam’zelle Hortense», in 2000.